This year’s Comicon convention in San Diego has resulted in a flurry of high definition related news and announcements. 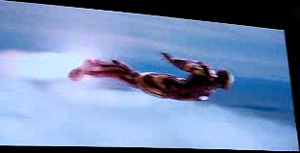 Today, I thought I would share a newly posted video clip of the Iron Man movie preview, which will be coming to theaters in May 2008. Robert Downey Jr. stars in the lead role as Tony Stark. From viewing the preview, it looks like it is going to be one heck of an action-packed film. For more info on the history of the Iron Man movie, check out this article on Wikipedia and don’t forget to check out the preview video embedded below. Iron Man will be distributed by Paramount Studios, so we should expect to see the movie come to Blu-ray and HD DVD near the end of 2008. UPDATE3: Another YouTube version embedded. These keep getting taken down, but I’ll keep embedding news ones if I can find em! UPDATE4: Well these videos keep getting taken down, so I am done trying to link up new videos. Try searching the net for “Comicon IronMan preview” if you really want to dig this up. UPDATE5: Watch the preview in QuickTime format (.mov) at Apple.com. The video was taken down. Downey Jr. is one of my favorite actors, and Ironman is one of my favorite comic heroes. I can’t wait for this.